Spacewar was not the first computer game ever written (let's mention only OXO of Alexander Douglas and Tennis for Two of William Higinbotham), but it has an unquestioned place in the dawn of the computer age and the history of computer games. Spacewar was the first to gain widespread recognition, and it is generally recognized as the first of the "shoot-'em' up" genre. 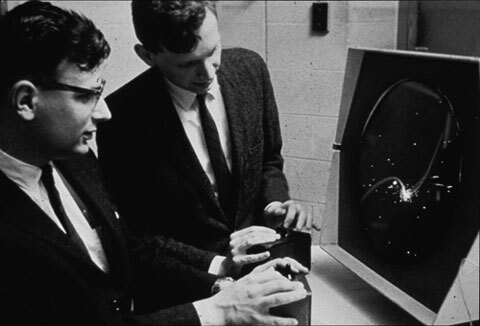 Spacewar game was commenced in 1961 by the young computer programmer from MIT Steve "Slug" Russell (born 1937), who was inspired from the writings of the early science fiction author Edward Elmer Smith. 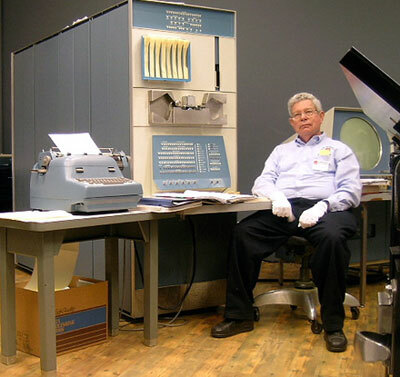 Russell wrote Spacewar on a PDP-1, an early DEC interactive mini computer (the first commercial time-sharing computer) which used a cathode-ray tube type display and keyboard input. Spacewar was a two-player game, with each player taking control of a spaceship and attempting to destroy the other. A massive star in the center of the screen pulls on both ships (called "the needle" and "the wedge") and requires maneuvering to avoid falling into it. In an emergency, a player can enter hyperspace to return at a random location on the screen, but only at the risk of exploding if it is used too often (there was an increasing probability of the ship exploding with each use). Steve Russell needed about 200 man-hours to write the first version of Spacewar, and he was assisted by his friends from the fictitious "Hingham Institute": Martin Graetz and Wayne Wiitanen. Additional features were later developed by Dan Edwards and Peter Samson. The game spread rapidly to other programmers, who began coding their own variants, including features such as space mines, cloaking devices, and even a first-person perspective version, played with two screens, that simulated each pilot's view out of the cockpit. It became was extremely popular and was widely ported to other computer systems.